The idea of relying on a sump pump that functions from your house current could actually be all wet. Most likely when you’ll need a pump, there’s likely to be a power failure. That’s the reason for this good backup pump. It takes over if your primary pump fails to start or if the water level ascends to a point that indicates the primary pump is not functioning as it should. And, that of course, can happen if there’s a power failure or if the water comes rushing into the pit a little too fast. The Wayne PC2 is a portable, non-submersible, water transfer pump that has the capacity to pump 340 gallons of water per hour @ 0 feet discharge head. It is made of a rugged metal motor and pump housing. The bronze intake and discharge is chrome plated to protect against corrosion and thread damage common in most water pumps. It has a suction hose, which enables it to drain water down to 1/8” off the floor. This compact and portable water pump has a powerful 115V motor. With this sump pump in your pit, you wouldn’t have to spend a rainy night worrying about your flooded basement. It is supposed to be self-priming but it helps to use a tablespoon of vegetable oil just in case. This is a small portable pump that is great for common household use. It can be used to drain water from catchment tanks, to flush or siphon water out of water heaters. 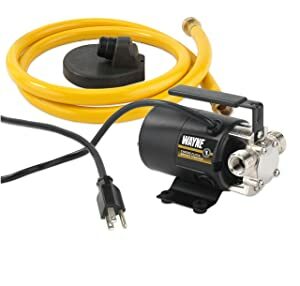 In addition to clogged basements, this pump does well when used in flushing out water from tank less water heaters and many other applications including expelling most of the water up into rain barrels. – Has a maximum suction lift of 6 ft. The pump has a durable heavy-duty bronze plated housing that protects the main parts like the discharge point and the volute protect against corrosion as well as against thread damage that is commonly seen in most plastic pumps. It moves a good amount of water rather quickly without getting too hot which is a very good feature for a motor with 0.1 HP. The pump weighs only 7 lbs. making it very light, portable and ideal for use as an emergency pump. It connects easily to standard household outlets. The discharge accepts a standard garden hose so you can swap the 6ft. hose attachment that comes with the pump. The pump comes with replacement parts such as an impeller, motor brushes, a hose gasket, etc. Although it does not make too much noise like most sump pumps out there, it does get a bit noisy at times so make sure you have some ear protection at hand. The pump has a low lift and cannot be used to pump water out of sumps. It works well for common household requirements and can only move a small amount of water at a time. Moreover, it is more suited to move cold water. The hose is opaque which makes it hard to see the water flowing. It needs to be supported to stop it from moving around or you could just stand around holding it until it finishes the job. The inlet and outlets are male fittings; you need a female adapter to connect it to another hose. The pump is said to be self-priming but the popular verdict (as noted in several pump reviews) is that it needs a little vegetable oil to get it started. Overall, it is a useful pump to have around the home. This little fella does what it should. It has its fair share of pros and cons so think about what you would use it for and just go for it. You won’t be disappointed.